Hi. My name is Spunky, and I’m the guest dog-blogger today. You may have heard that January 21st is National Squirrel Appreciation Day. On this day, I want to express my solidarity with card-carrying squirrel-haters everywhere who think that whoever came up with the idea for this national event is, well, nuts. Unless, perhaps, for the sheer fun of chasing them. They are fast. And dodgy. In addition to their scientifically proven tendencies to lie, cheat and steal, they like to taunt and run. I have never actually caught a squirrel. I know of a very large dog who did once. This was only after the squirrel darted back and forth along the top of the deck wall. He chattered, hissed and generally mocked the large dog. The big, angry and sharp-jawed canine appeared to be – to the squirrel anyway – safely hemmed in by the wall. This wasn’t the brightest squirrel in the family tree. It did not end well for the squirrel. 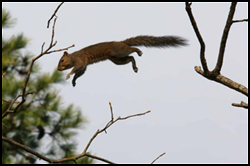 Despite the untimely end of that particular squirrel, most squirrels are smarter and far more adept at the taunt-and-run tactic. (Unless it involves cars.) This tactic is often targeted at dogs who – unlike a cute Cocker Spaniel I know – can’t climb trees, fences or decks. And squirrels can run very fast. Dogs are fast, too. However, they are far more likely to be restrained by a leash, a fence or an impatient (by dog standards) owner. Dogs know all this and so do (most) squirrels. This is why the war between squirrels and dogs rivals that of cats and dogs, Hatfields and McCoys, or Sharks and Jets. Beady-eyed, long-whiskered, bushy-tailed rodents with an attitude. Go ahead and double, triple or quadruple this or other nutty recipes. 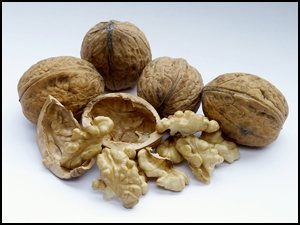 More walnuts for you = fewer for the squirrels. So they’ll have a little less energy to chatter incessantly and annoy neighbor-dogs like me.